After 25 years, Lalime's feels dated — not that the regulars seem to mind. 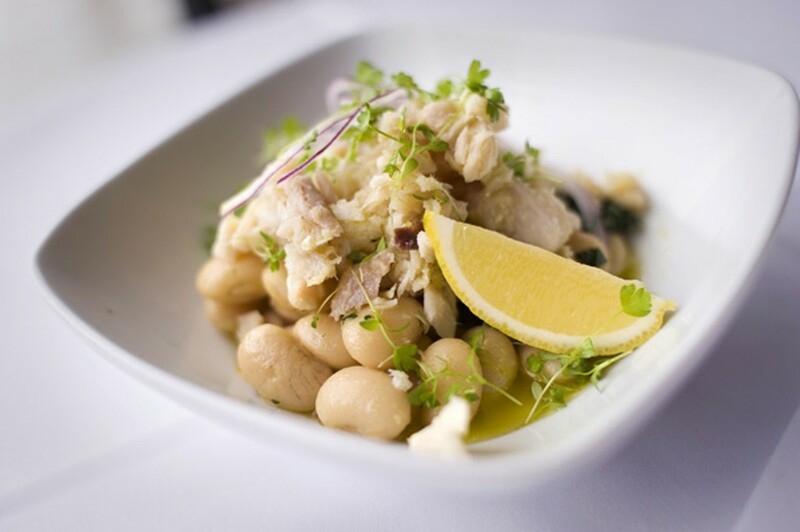 The tuna confit blended beautifully with Italian butter beans. Hours: Sun.-Mon. 5:30-9 p.m.; Wed.-Thu. 5:30-9:30 p.m.; Sat. 5:30-10 p.m.
Lalime's in Berkeley celebrated its silver anniversary this year, a stately occasion that can be hard to wrap your head around. In restaurant years, 25 is practically an epoch. Some of us were still kids, giving four-star reviews to Elio's Pizza and fruit-on-the-bottom yogurt, back when this place opened. And yet, with the distinctly aged feel of a bistro trapped in amber, Lalime's makes it easy to feel transported. It exudes musty whiffs of a restaurant long before our time, with little anchoring it in the here-and-now. Located on the sleepy borderlands between Berkeley and Albany, Lalime's is a boxy little structure, geographically removed from its contemporaries. A glance through immense street-side windows shows a low-lit, neutral-toned diorama. Silver hair and subdued laughter, frozen in time and space. As my party inspected the menu outside, it was hard to imagine disrupting the still life. The detachment lingered as our hostess whisked us past the polished dark-wood bar, down to the timelessly bland first-floor seating area. Dark carpeting (a restaurant feature I'll never understand) and staid white tablecloths trumpet Lalime's fine dining pedigree. The room is awash in browns and yellows, soft and nonconfrontational. There was no music during the first visit, and the collective din remained low. Natty servers bustled around, bedecked in crisp white shirts with tie pins and aprons. The crowd trended sixty-plus, with the occasional younger patron out with parents or professors. A quick menu perusal revealed few surprises. Perhaps it's the result of Bay Area Burnout (a precious disorder), but Lalime's options resembled innumerable farm-to-table restaurants. Grilled pork chops? Seared scallops? A high-end burger? This place isn't trying to break the mold. For an opener, the fresh chicory salad made a strange bedfellow with chunky mashed avocado on crostini. Much like a plate you'd throw together at a buffet, it offered little connection between items. More unified was the tuna confit with Italian butter beans, swimming with bits of shallot and micro celery in a glistening olive oil bath. 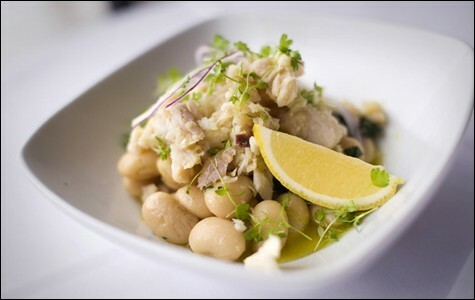 The tender, slow-cooked fish achieved a consistency close to pâté, blending beautifully with the creamy beans. A hot crock of salt cod potato cazuela was served with sweet baguette rounds and a tangle of frisée and pickled fennel. Each element had its own subdivision on the rectangular plate, creating a handsome little triptych. The fish-flecked cazuela mash was shy on flavor and high on oil, but salvageable: I spooned it onto the bread bites and added pinches of greenery for depth. There's a visceral appeal to DIY meal assembly, hopefully a more sophisticated impulse than just mucking around with my food (fruit on the bottom, anyone?). My feelings on the beef tongue were conflicted, like a bothersome art piece you can't stop talking about. No complaints on the meat, supple and soft, lightly warmed, with only a kiss of gaminess (perfect entry-level tongue for the squeamish). But a poached egg supernova was splayed on top, with the whites sloppily ribboned like drunken cake piping. Weirder than the aesthetics was a decision to serve the egg ice cold (chef Brian White told me later this was an error). I didn't mind the chilled yolk as a sop for the tongue, but the gelled whites were a strange affront. Entrées ranged from forgettable to bad. The well-prepared bacon mushroom burger used excellent Storm Hill beef, only suffering from a bit of sog in the bun. Fried sweetbreads were juicy and mercifully lacking in membrane, served with mushrooms and a heavy gravy. The grill-marked pork chop was smoky, tender, and boring, though I loved the accompanying cabbage, stuffed with creamy mashers and farro verde bits. An overwrought trumpet mushroom plate was a mess of competing textures, barely rescued by its delicate potato gnocchi and tender creminis. And the white sea bass and calamari? Tough and terrible. Most desserts followed a theme: starch, seasonal fruit, and ice cream. I spun the roulette wheel and picked the apple crepe with vanilla bean ice cream. It had notes of autumn, and the ice cream was good, but the overall effect was cloying and sweet. The one rogue dessert, a butterscotch crème bruleé, gave me cafeteria pudding flashbacks (maple leaf spice cookies didn't help). Chef White is relatively new at the helm, moving from sous to executive chef last year, but the menu has little new-school flash. This kind of farm-to-table fare has been coursing through Berkeley's veins for decades, largely an exercise in theme and variation. To me, the food was uninteresting at best, ill-prepared at worst. Yet no one seemed to mind. Even on a chilly Monday night, Lalime's wasn't hurting for business. The gilded crowd laughed on, ordering multiple courses and bottles of wine. I saw a remarkable number of repeat customers on my two visits, many greeted by name. It doesn't seem a stretch to imagine that these diners have been visiting for decades. Why should it change? Certainly not for a punk like me, well outside the restaurant's target demographic. On my second visit, a neighboring diner asked his server, "What are you bringing me tonight?" He let the house choose his entire meal, delivering rave reviews after each dish (I'm guessing we don't share the same palate). But to this audience, the food's appeal is likely enhanced by familiar surroundings. Lalime's is a low-key, unassuming place, where ingredients are locally sourced and the servers know your name. The mood is mellow, the lighting is low, and you'll probably run into a friend. Maybe that's good enough.